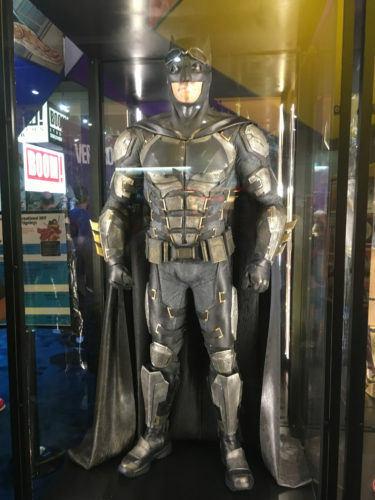 For the past few years, the DC Entertainment booth has featured movie costumes at its center — for the 75th anniversary of Superman, costumes from George Reeves to Henry Cavill were on display. For Batman’s 75th, they had Keaton to Affleck. Two years ago the CW got the center stage, while last year was split between Suicide Squad and Wonder Woman. This year, Wonder Woman’s slight redesign anchors the Justice League. Henry Cavill’s Superman suit is nowhere to be seen, because spoilers, though thanks to a preview of Mattel’s Justice League toys, we know what everyone already knew — Superman will return. Take a gander at who else will return for the League. 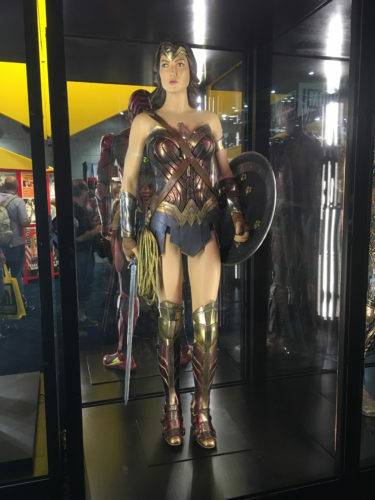 Wonder Woman’s costume seems a little brighter, which goes along with the rumor that DC Films are trying to give us a Justice League that’s more in line with the four-color world that people, you know, loved for a few decades. And Gal Gadot is just the actor to give that to us. Batman (Ben Affleck) also has an odd detail — in addition to the goggles (which perhaps foreshadows the Knightmare sequence from Batman v Superman), the suit has yellow glove highlights. I’d get strangely giddy if by the end of Justice League he has the yellow circle back around the bat symbol. 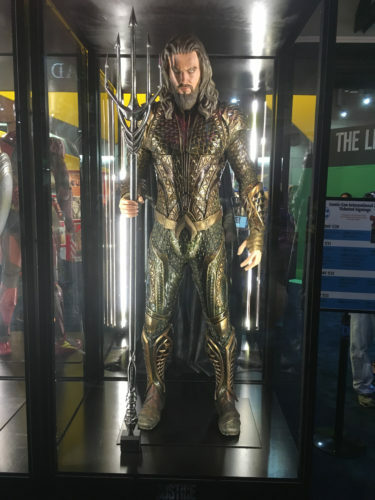 The previously released Batman v Superman toyline has shown off this Aquaman (Jason Momoa) costume. 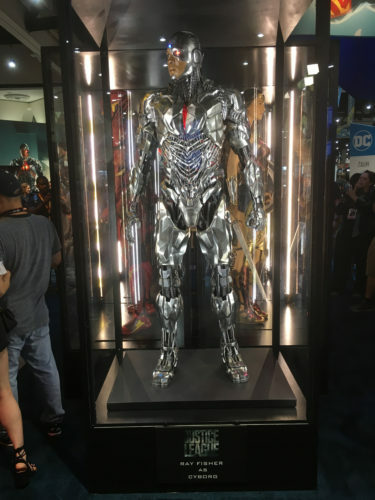 While the trailer has shown him a little less clad on the torso, this costume looks a little more like a riff from the comics. It’s subtle, but the trunks go from green to something a little more orange (let’s call it coppery) on his tunic. It’s not brightly colored, but let’s face it: his costume is meant to be fashionable at the bottom of the ocean. What’s the point of bright? 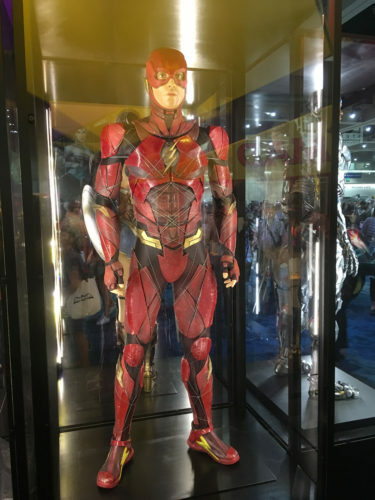 Ezra Miller’s Flash costume still looks a bit Beetleborgish to me. The television version looks more flexible and leathery; I’m just not sure of the justification to make Barry Allen armored. I could see a similar design working well for the revamped Green Lantern Corps. And then there’s Cyborg (Ray Fisher). 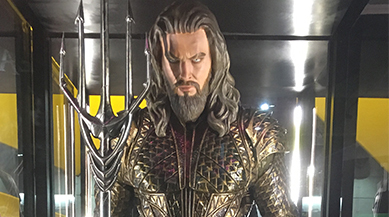 If DC is displaying a costume, that does mean that Fisher will have a suit utilized for more practical effects than constantly done by computer. Standing still and brightly lit, it looks better than it does in the trailer, though again, having a cavern in your presumed weak spot seems like just asking for trouble.